A few things before I tell you about this amazing recipe! First, considering that this isn’t a “foodie” blog, I find it funny that my most consistently viewed post continues to be my “Easy Peasy” Chicken Enchilada recipe thanks to Bembu – I’m forever grateful! Second, I LOVE food – all kinds, so I’m thrilled to have an outlet to share that love; and lastly, I regained my love for food and cooking when I got sober, which is truly a gift in my mind. While I don’t focus on writing about food, it’s always on my mind and once in awhile I’ll come across some recipes that I MUST share! So, this week I’ve decided to change things up and do a little “healthy eating, but still tastes good” themed week of posts. And, on Friday I’ll end the week with a not-so-healthy look at my very favorite treat in honor of a special day. So, just roll with it and hopefully you’ll get something out of it along the way! Okay, so onward to Paleo Granola. Please, please don’t let the name scare you away! I know the whole “Paleo” thing has been all the rage lately, and to be honest, I was a little skeptical at first. However, a number of family members and friends have had GREAT success with the Paleo lifestyle – and, really, that’s what it is – a lifestyle. While I admire those who can do strictly Paleo, I’m afraid that I enjoy a few non-Paleo items just too much. And, really, I already gave up alcohol, so in many ways I feel like I’ve done my “duty” in the area of giving up things for health-related reasons – at least, that’s the excuse I’m using for now! But, that still doesn’t mean I won’t incorporate some yummy recipes into our daily living. Recently, we were visiting my husband’s aunt and uncle, who practice a Paleo lifestyle, and his aunt had made this wonderful – seriously-out-of-this-world granola. Disclaimer: I could live off of Greek yogurt, fruit and granola. I’m pretty sure I’ve had every variety of granola out there (hello, my parents were hippies!) and this was the BEST. Turns out it’s Paleo and comes from Stacy at Paleo Parents (oh, and my kids love it!). I prefer mine over plain Greek yogurt with a little honey and fruit, but you can eat it however you like – right out of the container it great too! Greek yogurt, fruit and granola is my breakfast every morning. 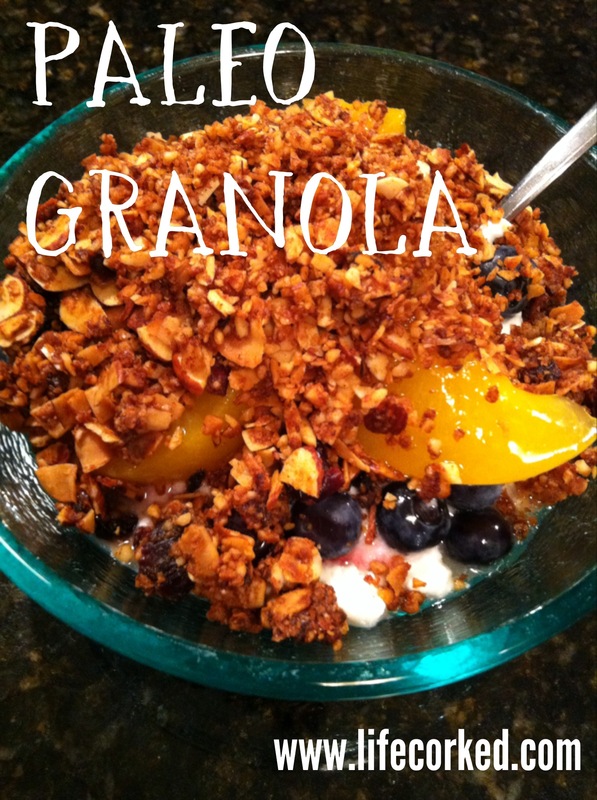 Usually I buy Naked brand granola, but this sounds really good and I plan to make some this weekend. Thanks! Hey Kristen! It’s SO good! 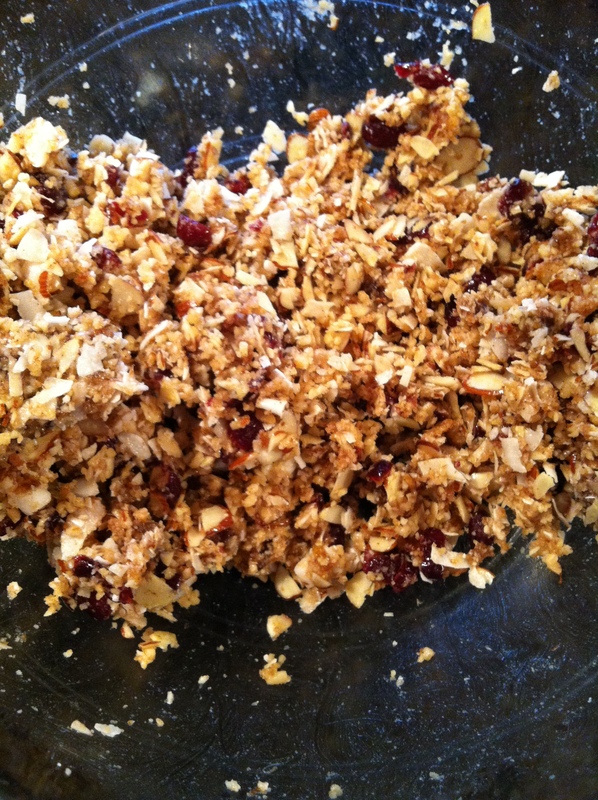 Honestly, I was a little scared of anything Paleo, but this granola totally changed that for me. It’s a little time consuming to make, but it makes A LOT so you don’t have to make it again for awhile! I just posted a Paleo waffle recipe that is really good too! Karen, this is a great recipe to add/subtract from! I think the gal who created it adds dried apricots sometimes too. It’s seriously, so good! Check out the Paleo waffle recipe I just posted too! ← Does Alcohol Make You Crazier?